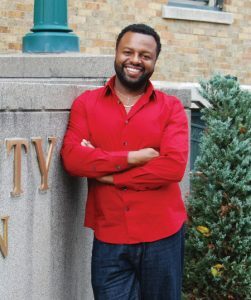 When Timothy Bryant was growing up in a tough New Jersey neighborhood, he enjoyed school and believed that despite the difficult circumstances of his life, he was destined to go to college and have a rewarding career. But that notion started slipping away from him at age 9, when he was the victim of a violent crime. He felt like it was ripped away for good when he was attacked again at 14, and his dreams were replaced with raging Post Traumatic Stress Disorder (PTSD). “I found myself unable to function socially for several years, and as a result I was unable to complete high school,” Bryant, now 50, recalls. He struggled to come to grips with what his life had become, but little was understood about PTSD at the time. “I was living and operating in ‘survival mode,’” he says, as he tried to comprehend and treat his disorder. This led him to massage therapy, which can help individuals heal from grief and trauma. He completed his GED, became a licensed massage therapist, and assumed that this path would be his life’s journey. Then Sandy Lane, Ph.D. walked into the Syracuse spa where Bryant was working, and his life turned in a bold new direction. Lane was a Syracuse University professor of public health, and as she came to know him, she recognized abundant intellectual potential as well as a passion for helping people. She encouraged him to pursue a college degree through the Arthur O. Eve Higher Education Opportunity Program (HEOP) at University College. HEOP provides academic and financial support for students whose life circumstances might prevent them from attending SU. It is the only program of its kind for part-time students in New York State. What unfolded in Bryant’s college journey would surpass his wildest dreams. He made the dean’s list every semester on his way to a bachelor’s degree in public health in 2015. He traveled to Europe and Africa, and was inducted into Alpha Sigma Lambda, the honor society for nontraditional undergraduates. And he received one of SU’s highest student honors—the Chancellor’s Award for Public and Community Service—for a smoking cessation program he and three classmates designed and implemented at the Syracuse Community Health Center. National recognition came from the University Professional and Continuing Education Association (UPCEA) in 2016, which named Bryant the Outstanding Continuing Education Student of the Year. Last year, Bryant learned that his bachelor’s degree would not be the end of his educational journey. He was admitted to SU’s Ph.D. program in Sociology, with four years of funding.